When it comes to items that are undervalued, the picnic flask must be near the top of the list. We’re a picky bunch aren’t we generally, us humans? Always finding something to have a little moan over. The weather is too hot or Game of Thrones is two awesome episodes and eight average ones. Every season. The same can be said about our picnic habits. Especially when it comes to the temperature of our food and drink. How many times have we brought along a cold bottle of water or soda from the refrigerator? Only to curse aloud, when after an hour in the sun it has turned into something resembling Dante’s Inferno? This, despite the fact you sneakily hid it under your clothes to maximize shade. Or how about remembering you have a flask of hot coffee especially made for when the weather turned? But when that coffee passes your lips, you have to spit it out due to cold coffee really not tasting that great. Luckily for us, vacuum flasks exist and they make all our temperature niggles disperse. They work by creating a vacuum between at least 2 layers. This means that the normal process of temperature flow, convection, is virtually annulled. And anything placed inside, which in our case is soda or water, will keep similar temperatures for many hours. It’s not just drinks that we try to regulate the temperature of, in this article about Thai picnic ideas we suggested starting your picnic with a soup. To make this a viable option we really need a tool that can keep the soup at such a temperature that we deem it edible. Especially in the cases of the thicker, meatier soups. Most of us own one but are we getting the best from our picnic flasks? Below, please find a selection of picnic flasks we think could suit your picnic needs. This picnic flask is stainless steel with a triple layer vacuum insulation. It comes in a range of sizes going from 12oz all the way up to an impressive 34oz. 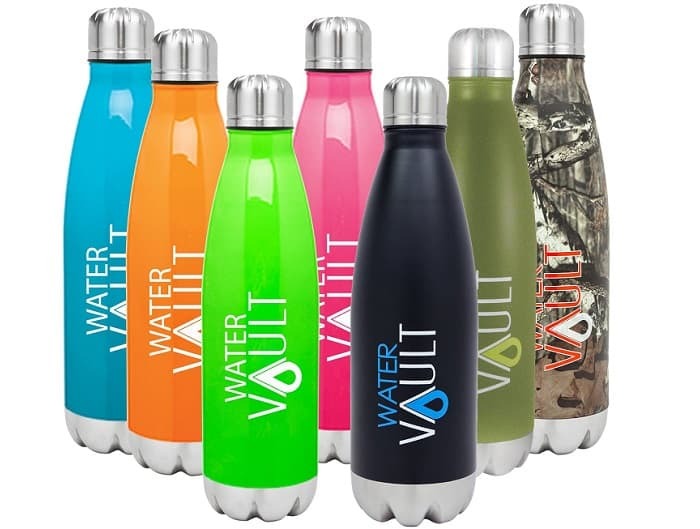 The WaterVault has a thin neck that they say will hold temperatures better. Whilst there are varying degrees of success in reports for keeping liquids hot, there seems to be an emphatic overall response to the ability to keep liquids cold. Some reviewers claim that ice still existed after 36 hours. The brand that is synonymous with the vacuum flask genre, Thermos offer up this amazing 40oz behemoth. Perfect for family picnics, this flask is works best when storing your hot drinks. But that does not mean your cold drinks will suffer. Equipped with a stopper that serves as a spout when twisted, this flask will not lose heat like other flasks can sometimes do when the lid is removed. The lid doubles as a cup which really complements this picnic flask.. This picnic flask has to go down as one of the most stylish on the market. The Zojirushi SM-KHE48AG (try saying that three times in a rush) is also compact enough to effortlessly fit in your picnic basket. Coming in 12oz or 16oz options along with some quite stunning colors. This picnic flask will stand up to all your needs. Featuring a wide mouth it also comes with a flip lid. Thich has a safety lock so there are no accidental spillages. It won’t keep your desired temperatures as long as the other options here. But 6 hours is definitely long enough for a picnic and you might get to show this beauty off to a few passers-by. 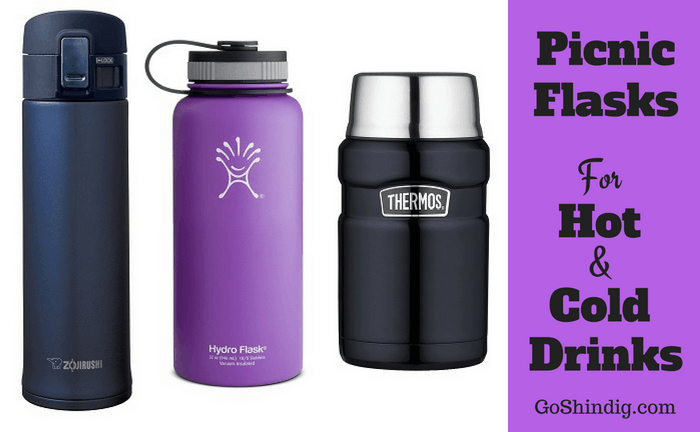 Whilst the Hydro Flask may have the more classic look of a sports bottle, rest assured that this flask will easily keep your hot drinks piping for many an hour. The makers say 24 hours for cold and 12 hours for hot which is brilliant news for anyone wanting this as a picnic flask. You also get a few bonuses with this flask, number one is it comes with a lifetime warranty! So you can rest, safe in the knowledge that should anything EVER go wrong you can send it back for a replacement. As well as this, the flask comes in multiple colors. And for the more charitable of you, it will be nice to hear that 5% of all sales go to charity. The Thermos Stainless King makes a reappearance on the list but this time for its food range. Flasks with the ability to store hot food increase your options for your picnic spread immeasurably. Whilst obviously not being able to store an all you can eat buffet in there the options for hot pasta, stews, chillis, to name a few are all possible with the food flask. It boasts 24oz of space with double wall vacuum insulation. This means no matter hot or cold the items you place inside the flask are you will never be able to tell on its stainless steel exterior.